1. Raised garden bed. Having this factor is important for creating a good drainage system, so that the red banana tree can grow nicely and efficiently. When determining if the banana sucker is good or not, make sure that it has a thin, pointy shape to its leaves, for that shows that it is adequately healthy with good nutrients. Large, round leaves, on the other hand, are best to be avoided. 3. Shovel. This will be used to dig the earth for planting the red banana tree. For this occasion, it helps to go with a large shovel, considering that it will be a large plant when it reaches maturity. 4. Soil. Choosing type of soil to be suitable for tree. Loose, rich soil is the way to go for planting this particular fruit tree. Avoid using normal potting soil, however, and instead invest in ones with a slightly acidic quality to it, between pH 5 and 7. 5. Fertilizer. Typically, f﻿ert﻿ilizers consist of a nitrogen-phosphorus-potassium balance (N-P-K for short) with varying ratios depending on the plant’s needs. For red bananas, they are just like regular bananas in that they need an overwhelming amount of potassium for growth, so it is best to get fertilizer with that sort of ratio. 6. Water. Just like any plant or crop out there, red bananas need water as means of growing. However, just a bit of water will do from time to time, for overwatering can be a problem. 7. Wire and Rope. Since banana trees, in general, tend to grow tall and heavy, you will need to make sure that it does not topple over while its growing. Wires and ropes do the trick, along with bamboo. Bananas, let alone red ones, thrive especially in hot, humid weather, with temperatures of around 30 degrees Celsius (86 degrees Fahrenheit) and a humidity of 50 percent or more. More importantly, however, is that the environment remains consistent, since they can take up to a year to yield fruit. Make sure that you also find a place with lots of sunlight, since banana trees thrive with long hours in the sun. In addition, choose a good site for a drainage system, hence why an elevated garden bed will come in handy. Finally, give the red banana tree plenty of space to grow. If necessary, dedicate your entire backyard to growing this plant, and grow other crops indoors or out on the curb. It requires a lot of your attention, so it is best to place it in an easily-accessible area to get to when needed. Using some gardening scissors, trim off 1 to 2 inches off of the banana sucker, so as to prevent it from getting diseases. Considering that you are starting with a small, banana sucker, you will not need to dig a large hole to plant it. By using a shovel, simply make a 1x1-foot hole for it. Place the slightly-acidic soil into the hole, then plant your sucker into it. Make sure that the sucker is planted upright and firmly pack the soil in to keep it in place. 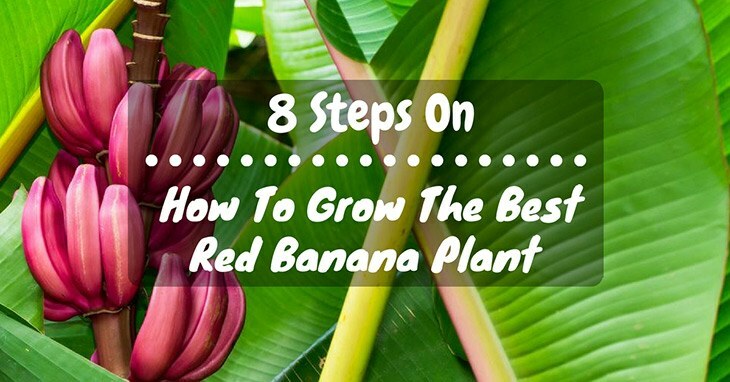 When it comes to caring for the red banana plant, fertilize on a regular basis (about each month), feeding it with potassium-rich elements and even consider adding compost and manure to help boost its nutrients for an effective growth. Another thing to consider is adding mulch, which gives back nutrients to the soil after trimming the plant. Water around the plant, making sure not to overwater it, but only do so when you notice the soil to be dry. Depending on how cold the weather is, you might sometimes only need to water the plant one to two times a week. Overwatering can cause damages to the roots, which affects its development, so it is better to water less than more. Like with any other plant out there, red banana trees are also susceptible to weeds and dead leaves. Trim them off whenever you see them about to sprout. Additionally, it is very important to notice for any signs of pest diseases and take measures to get rid of them. It is a matter or either trying out pesticides (which can be risky for the plant) or, more simply, uproot them and place them somewhere else. When your red banana plant reaches maturity, it will yield several suckers, of which you will need to remove for better growth and health. Simply cut off the suckers and the remaining ones (usually no more than two) will be the “followers” of the main plant by taking over in the case if it were to die. As it grows, red banana plants will start to get top-heavy from the fruit it is growing. To prevent it from toppling over, you can either use the wire-and-rope method, or the bamboo method. For the former, take a plastic bottle and cut off the bottom of it. Thread the wire through the bottle and bend it. Prop it against the red banana plant stem and tie the wire around it to keep it stable. For the latter, take a bamboo stem and cut it into a “Y” shape. Prop the groove of it against the banana stem and plant the other side firmly in the ground. Overall, red banana trees are a wonderful plant to consider growing, since it adds that extra character to your garden. While it will take time for it to grow, it will yield amazing fruit at the end of it all. Enjoy your gardening!